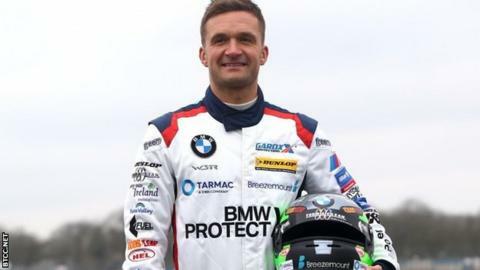 Colin Turkington recovered from a disastrous first race to claim a fifth place finish in the British Touring Car Championship round at Oulton Park. A misfire issue dropped The Team BMW driver from fifth to 29th in race one, which was won by Andrew Jordan. The Portadown driver made his way through the order in race two, ending up in 23rd spot. Race two was won by Ash Sutton, while Gordon Shedden took the lead in the standings with victory in race three. In race one Turkington held fourth place in the early stages, despite running with a misfire issue which had hampered him in qualifying, behind Scottish teenager Aiden Moffatt as a queue of drivers formed behind. Sutton managed to get past Turkington with a move at the Island Bend, before contact with Moffatt resulted in a drop of power in his BMW which resulted in the 35-year-old crossing the line in 29th place. In race two, Turkington made stellar progress through the pack, sneaking into the points despite starting in 28th. The race ended in messy fashions as Senna Proctor pushed Turkington into Jeff Smith, spinning Smith's Honda around at the final corner. Turkington made a fast start in race three, moving up to 11th by the end of the first lap. He picked up another position when Honda driver Shedden hit second placed man Josh Cook, sending the Maximum Motorsport driver out of the race. Four more moves on Jason Plato, Mike Epps, Rob Austin and team mate Rob Collard gave Turkington a fifth place finish. Chris Smiley also had a tough weekend having only been able to qualifying 30th after a power steering issue. The BTC Norlin Racing driver was forced to pit at the end of lap one in the first race after, before re-joining the race three laps down as he finished 29th. The Carrickfergus drivers' struggle continued in race two, coming home in a quiet 27th place as he aimed to stay out of trouble. Smiley picked up his best result of the day in race three, coming home in 20th place with a solid drive. Despite the difficult weekend, Turkington is fourth in the standings after Tom Ingram, leader heading into Oulton Park, only scored one point after a tough event. In the support series, Dan Harper had a difficult weekend as he bogged down from the front row at the start of the first Ginetta Junior race, resulting in the Hillsborough teenager getting launched into the air after he was pinned between two other cars with Harper having to pit with damage. Harper, starting from pole in race two, was again slow off the line, dropping to sixth as he collected a fifth place finish. Charlie Eastwood lost his lead in the Porsche Carrera Cup standings as he was spun at the first corner, recovering from 12th to finish seventh. In race two, the Belfast driver collected a third-place finish after a red flag ended the race early. Adam Carroll's difficult debut season in Formula E continued as he finished 15th in the Pairs ePrix.